Castlevania: Lords of Shadow (キャッスルヴァニア ロード オブ シャドウ, Kyassuruvania Rōdo obu Shadō?) is a video game in the Castlevania series, and is a reboot of the franchise. It is an action-adventure game in a fantasy setting in Southern Europe during the Middle Ages. The game was developed by MercurySteam and Kojima Productions and published by Konami. Hideo Kojima, producer of the Metal Gear franchise, was involved with the title. 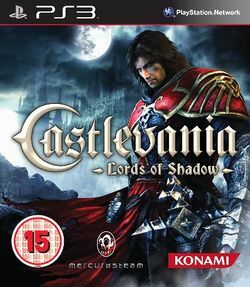 The game was originally announced as Lords of Shadow with no connection to the Castlevania series mentioned. According to Konami, this was to keep their plans to radically change the direction of the Castlevania mythos a secret and to prevent the announcement of the game from upstaging their other series release at the time, Castlevania Judgment. The game is a reboot of the franchise and is not a part of the original series canon. The setting of Lords of Shadow is during "the end of days" in the year of 1047. The Earth's alliance with the Heavens has been threatened by a malevolent force known as the Lords of Shadow. A dark spell has stopped the souls of the deceased from leaving, while evil creatures inhabit the dying land and attack living people. The main character, Gabriel Belmont, is a member of the Brotherhood of Light, an elite group of holy knights who protect and defend innocent people against the supernatural creatures. Gabriel's wife Marie was brutally murdered by one of them, and her soul cannot leave as it is trapped in limbo. Because she is now neither alive nor dead, she realizes what is at stake and guides Gabriel to his destiny to save the world as he investigates the dark spell. He travels the destroyed land, meeting other characters such as the oldest living member of his order Zobek. Two masks referred to as the God and Devil Masks, lie at the centre of the plot, with the God Mask having powers to resurrect the dead. Gabriel intends to defeat the three factions of the Lords of Shadow in order to obtain the pieces of the God Mask, and bring back his deceased wife. This page was last edited on 11 October 2018, at 12:22.